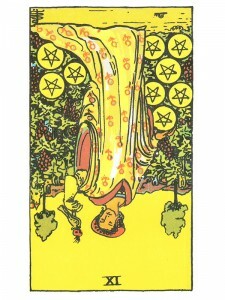 Nine of Pentacles (R) says utilize your communication, healing and inspirational gifts to re-evaluate your situation. You have gained much from your past experiences – analyze your goals and desires and trust that meditation will give you the answers. Ask for help with your affairs and you will find guidance in your prayers. When you “appear” to be entangled in a difficult situation – center yourself within, seek “inner” guidance and the solution will be presented. Move one step at a time – use your energy, vitality and assertion to remain flexible and open to new opportunities. Use the power of your communication and leadership skills to bring success to all concerned. Follow that which has heart and meaning. Trust in your own authenticity and truth – organize things and become magnetically open to following your true hearts desire. Failure, wasted work and saturation comes from lack of discipline. KNOW and recognize what you want – what really matters to you, then channel your energy into useful purposes. Various forms of improper understanding/use of this level of comfort, such as allowing yourself to become overly dependent on others, even to the extreme of becoming a “kept person”. There can be improper use of intelligence and knowledge of nature, leading to a decrease in the world system. Here we find smug, complacent, lazy behavior. What are you earning by your endeavors – material wealth, security, status? How are you enjoying what you have earned? How are you spending your leisure time? How do you give thanks for all that you’ve gained. Three Swords in spread: Keep tight reign on your expenses – this is not the time for careless spending. Next to Emperor: There may be an opportunity for a new position of responsibility which will mean an increase in finances – take the time to consider the added duties. Three Tens and World in spread: A major move is indicated, that possibility of a long vacation that will be very worthwhile. In the first position: In order for mind to achieve the proper goals of this lifetime, you may have to rely on others for support. In the second position: At one extreme, your challenge is in which resources to access and for what purposes, for there is an abundance far beyond your requirements. At the other extreme, what you need is not readily available. There may be resources aplenty, but not for your project. In the third position: On the one hand, things may be so good as to entrap you. On the other hand, you may be trying to kid yourself into thinking you are in a supportive situation and you are not. In the fourth position: The garden is complete only with the people that occupy it. Love of nature, of the environment which supports us, cannot be divorced from love of ourselves and our fellow man. In the fifth position: In one extreme, you know you have too much support for your needs or too much of the wrong stuff. In the other extreme, you know you do not have what you need. In the sixth position: What is so right for your basic needs, may provide an ironic test for your creative endeavors. A starving artist you are not, at least not physically – but, your physical situation may be far from what you need to bring you into the proper arenas for your emotional and creative purposes. In the seventh position: You may fear your ability to achieve on your own. In the eighth position: The situation you are in is not healthy. On one extreme, you are withering from lack of water. On the other extreme, you are drowning from too much of it. In the ninth position: On one hand, you may be all to comfortable and inert in your setting, neglecting your Karmic Contract. On the other hand, you may be sad at the lack of proper fit between you and your circumstances. In the tenth position: The old adage, “necessity is the mother of invention,” suggests one difficulty shown by this archetype. Namely, the temptation that if we don’t have to we won’t. Do not let that happen with you. It also suggests the very positive function of necessity.